Coming to a circumpolar constellation near you: An all-new, never-before-seen, awkwardly named meteor shower that just might knock your astronomical socks off. It's called the Camelopardalid meteor shower, and unlike annual showers such as the Perseids and Leonids that have been occurring for hundreds or thousands of years, it will occur for the first time the night of May 23 and early morning of May 24. 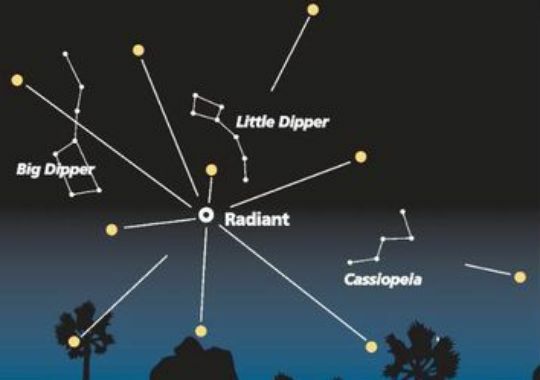 Look for the shower to radiate from a spot between the Big Dipper, Little Dipper and Cassiopeia. A meteor shower happens when the Earth passes through debris left in space by a comet (the Perseids, for example, are debris from Comet Swift-Tuttle); the debris, little chunks of rock and other material, burns up in the atmosphere to form what some people call shooting or falling stars. The Camelopardalids will be debris from Comet 209P/LINEAR, a very dim comet that orbits the sun every five years. The comet was discovered in 2004 by the Lincoln Near-Earth Asteroid Research project, a partnership of the Massachusetts Institute of Technology Lincoln Laboratory, NASA and the U.S. Air Force. But while the Earth has been passing through Swift-Tuttle debris to create the Perseids for thousands of years (the first written account of the shower was in 36 A.D.), this will be the first time the Earth has passed through Comet 209P/LINEAR's leftovers. Meteor showers vary in intensity: Some produce more meteors than others, and some years a particular meteor shower is better than other years. It all depends on how much debris the Earth passes through, and some astronomers are predicting that all of Comet 209P/LINEAR's debris trails from 1803 through 1924 will intersect Earth's orbit, so the Camelopardalid meteor shower will be a meteor storm producing hundreds of meteors per hour. So, how good will it be? "That's always a good question, more so with this meteor shower because it's the first time we're seeing it," said Rich Talcott, senior editor of Astronomy magazine. "Over the past 15 or 20 years, astronomers have done a very good job at figuring out, 'OK, here's where the debris streams will lie.' I'm thinking the odds are pretty good we'll get something nice May 24." Meteor showers are named for the constellation from which the meteors seem to radiate. That point is known as the radiant, and radiant for the Camelopardalids will be the constellation Camelopardalis (the giraffe). Camelopardalis is a circumpolar constellation, which means that, rather than moving from east to west across the night sky, it goes around Polaris, the North Star, so it's up all night. It's also easy to find because it's close to the Big Dipper and Little Dipper, two easily recognizable constellations. The meteor shower will be easier to view in the South, says Carol Stewart, astronomer at the Calusa Nature Center and Planetarium in Fort Myers, Fla.
"In Southwest Florida, we have an advantage over Northern latitudes because the meteors will come in at us from a lower altitude," she said. "Those are called 'Earth-grazers,' and they're longer-lasting and run farther across the sky." Aside from clouds, a meteor watcher's worst enemy is a bright moon, which can wash out all but the brightest meteors. On the night of May 23, however, the moon is not present, and it doesn't rise until 3:41 a.m. May 24. When it does rise, it will be a waning crescent, so it won't affect the meteor shower. Astronomers predict peak activity for the shower will be from 2 a.m. to 4 a.m. May 24, but Stewart will be looking at a wider window. "They could start as soon as it gets dark the night of the 23rd," she said. "I'm going to go out and check every hour. We don't know because this is the first time, and I don't want to miss it." So park your boat out in the middle of the lake Friday night, and get ready for Mother Nature's fireworks show.